I have had a headache for three days. THREE DAYS. I think it’s the combination of too much to eat this past weekend and too little sleep, and whenever I can’t sleep my arthritis gets uppity and my mind races and all of a sudden I’m imagining worst-case scenarios like the student loan people beating down the door and shooting my cat because they want Nick and I to pay a combined total of $998 per month in loan payments so we’re always coming up short because that is too many dollars and they would shoot the cat, I just know. So, to counter that, I have been taking melatonin by the handful to get sleep, and Nick says that you really can take too much of that. So, sleeplessness, oversleep, chemicals, joint pain, and never enough caffeine, and my head hurts. Also, logic has gone right out the window. With it, focus and discipline. Also, I’m a complainosaurus. But because of all this, and because I had nothing to do tonight, I made cookies, and now I am happy and the universe promises to right itself. Tonight I will get a good sleep. Or I will smother the cat in a valiant attempt at saving her from my bad dreams. Either way, the apartment will smell like cookies! 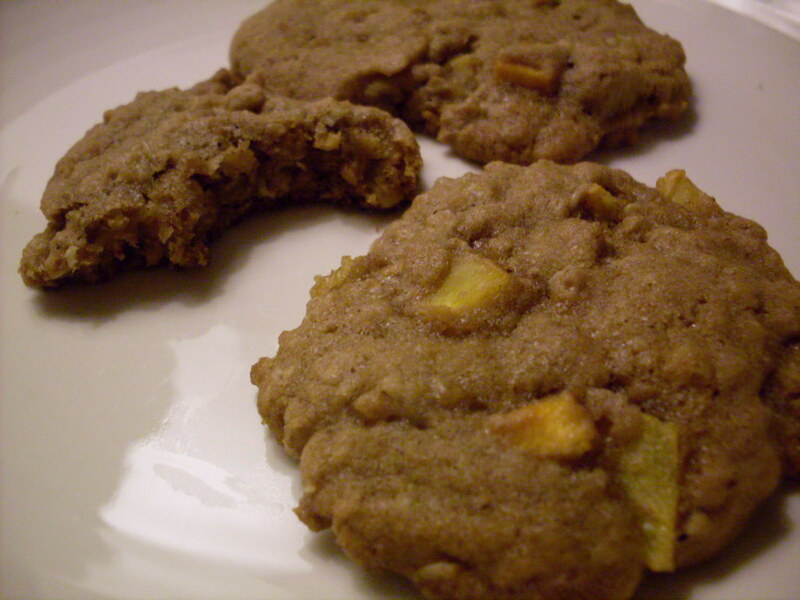 These are made with persimmons, because we get a lot of those around here when they’re in season. Peel them first with a paring knife, and mince them fine. Their mindblowing sweetness is tempered here, balanced with salt and spice, and they make the cookies chewy and delicious. They’re crisp outside, and soft in the centre – all good stuff here. Cream together butter, sugar, and molasses. Add egg, and beat until thoroughly combined. Add persimmon. 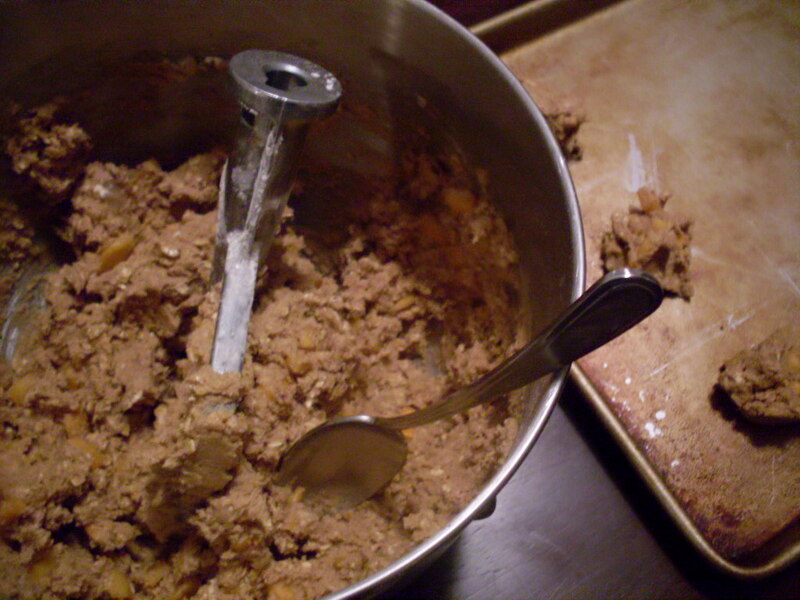 In a separate bowl, combine flour, salt, baking soda, cinnamon, ginger, cloves, and nutmeg. Pour gradually into wet ingredients, beating all the while. Add oatmeal slowly, and beat until well mixed. Drop by tablespoons onto greased cookie sheets. Bake for 10 to 12 minutes, until slightly puffed and golden. Cool on racks. Eat almost immediately. The autumnal spiciness of these will make any kitchen smell just wonderful, curing headaches and cookie cravings. I’m taking a plate of these to bed, where I’ve got a cold glass of milk waiting with a book by MFK Fisher, and by tomorrow I expect I’ll be a superhero. You too? Next > Broccoli with tofu and peanuts. 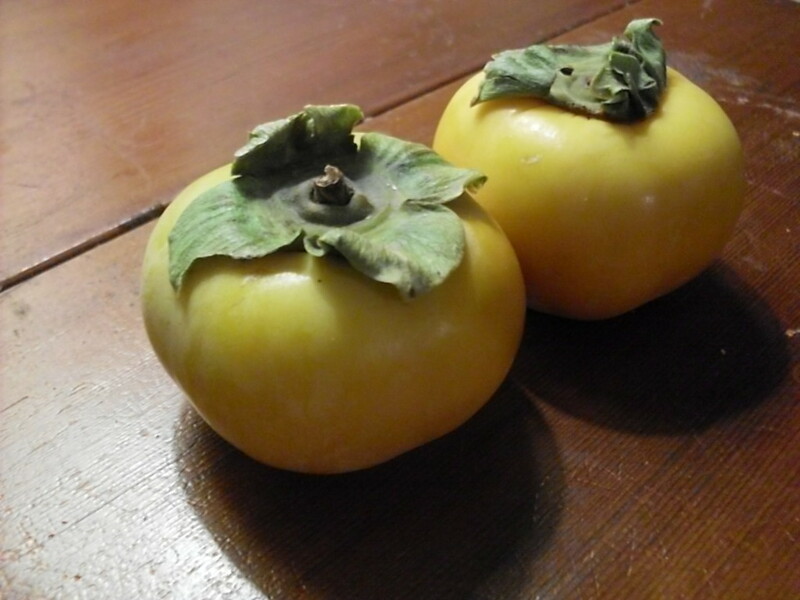 Oh man, I really like persimmons and there really are very few recipes that use them. Do you use the ones that get all soft and gushy, or do you use the ones that you eat while they are still firm? I used firm ones, but I bet smooshy they’d be okay too – the cookies would be softer. But smooshed, they’re really good with cranberries. And ugh … student loans … that is all.